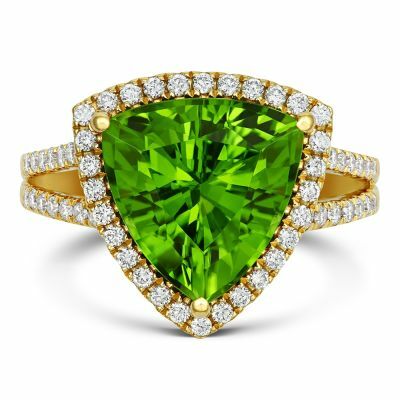 The month of August brings with it the birthstone, peridot, an exquisite green stone that has an eye-catching olive hue. 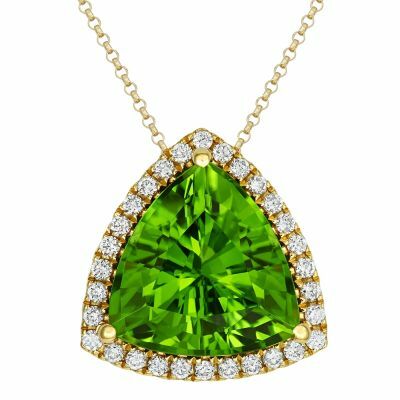 While the name origins of other birthstone are known, the peridot has a sense of mystery surrounding it. It is believed that it is derived from the Arabic word for ‘gem’ which is ‘faridat’. However, it may also originate from the Greek word ‘peridona’ which means ‘giving plenty’. There is something mystical about the peridot which is not just found on the earth but can rarely be found inside meteorites. The stone forms deep underground and is brought to the earth’s surface by volcanoes. This is why the peridot is a symbol of the tears of the volcano goddess of fire in Hawaiian culture. This gemstone has been known as the ‘Evening Emerald’ and the ‘Gem of the Sun’ and was thought to protect the wearer against nightmares and evil as well as providing healing and bringing happiness and peace. Egyptian priests even believed that they could use the stone to commune with their nature gods and would encrust goblets with the gem. The fabulous colour of the August birthstone matches the month beautifully as the green shade has a warmth to it which sits perfectly with the summer month. Not only does this stone hold a striking allure, it is also said to protect the wearer from negative emotions, making peridot jewellery a wonderful gift for a loved one. If you would like to see more of our peridot jewellery, you can do so at our Lancaster or Kendal store. Alternatively, you can view our selection of the August birthstone below. You can also benefit from 0% finance on our new and selected peridot jewellery from £500.